Phil Baines’s scholarly book, jammed with more than 500 covers, is a straightforward, no-frills chronicle of the evolution of Penguin’s design aesthetic and the publishing circumstances behind the icon. The tale really begins with Allen Lane, who hatched the idea to publish ‘cheap, good-looking reprints of fiction and non-fiction in paperback’. The classic horizontal grid was devised in 1935 by Penguin’s first production manager, Edward Young, and reformed in 1948 by Jan Tschichold, whose subtle changes (using Gill Sans and vastly improved letter spacing among them) solidified the Penguin identity. In 1961 Romek Marber devised a second, more image-friendly grid. The most exciting material in the book takes off from Marber’s revolution. Free from the horizontal bands of the 1930s, art directors used consistent typography and illustration to retain continuity within each genre. The results, particularly Marber’s highly atmospheric crime novel covers, were spectacular. Other major successes in the 1960s and 1970s include the Penguin Modern Poets series, with its uniform type and stunning back and white photography; John McConnell’s education titles with their typewriter fonts and small, ingenious illustrations floating in a sea of black; and finally, the haunting science fiction cover designs by David Pelham, who used the then-current surrealist-inspired science fiction illustration style to create unforgettable images of dystopian fantasy, unified by a black background and ‘computer’ style typography. 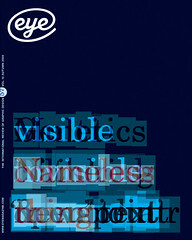 The 1980s and 1990s find Penguin rather adrift, but the most recent initiative, covered by Steve Hare in Eye no. 54 vol. 14, is a stunning success: debossed, type-only covers. Some of these stories have been told elsewhere and in considerably greater depth, including Rick Poynor’s spirited appraisal of Marber (Eye no. 53 vol. 14) and Richard Hollis’s fascinating profile of Germano Facetti (Eye no. 29 vol. 8), as well as the David Pelham story (Eye no. 22 vol. 6). Baines maintains a dispassionate, mostly uncritical tone, and keeps the book firmly focused on Penguin the company, and not necessarily the creative evolution of its designers. Of course there is only so much a single book can do, but given what has been written, it seems a shame that Baines didn’t engage much with the more intriguing personalities and stories behind the visuals, not to mention the historical context in which the covers were produced. Much of the book feels somewhat isolated from the visual culture around it. This not to say that Penguin By Design is not a solid read – it is – but it lacks the verve of a more accomplished writer and critic. Nevertheless, the number of covers included in the book and Baines’s precise, process-oriented text does make Penguin By Design a worthy graphic overview of a hugely significant publishing company.